This series of two articles focuses on the current development of the Russian Arctic region, while explaining and demonstrating the importance of using strategic thinking for governments as well as for business actors. Indeed, the international dynamics of geopolitical and environmental changes, including their interactions, are becoming so rapid and powerful that political and business actors have to integrate them, in order to be, or to remain, successful. In this first part, using strategic thinking, we shall notably establish how threats can be – and are – turned into opportunities, while constraints become drivers and systems of challenges are transmuted into powerful attractors. This approach dramatically alters the way actors could and should handle issues and uncertainties so far perceived as mainly negative. For that purpose, we shall study the current development of the warming Russian Arctic through the perspective of strategic thinking, i.e. by using the tools devised to understand the way strategic choices are implemented in the geopolitical arena, the opposition they meet and how the related counter-actions make them evolve (Edward Luttwak, Strategy, the Logic of War and Peace, 2002). Understanding what is at stake with the current massive industrial, military, infrastructural, and commercial development of the warming Russian Arctic is a particularly good example of the crucial importance of strategic thinking. In effect, nowadays, our world is changing very rapidly, because of the permanent interactions between the domestic and international political, economic, social and technological situations and planetary climate change, while furthermore natural resources are overused (Jean-Michel Valantin, “The Planetary crisis Rules, part 1 and 2”, The Red (Team) Analysis Society, January 25 and February 25, 2016). This change can appear as unexpected if one does not use an efficient methodology to anticipate the coming changes (Helene Lavoix, “Business and Geopolitics, Caught up in the Whirlwinds?”, The Red (Team) Analysis Society, November 23, 2016). Strategic thinking allows us to understand the consequences of these new combinations to anticipate, adapt and, most importantly, to do so successfully. Strategic thinking allows us to understand how and why the Russian political, military, industry and business authorities are turning the current and rapid warming of the Arctic ocean and land into a massive strategic opportunity for themselves and for their Asian and European industrial, financial and business partners (Jean-Michel Valantin, “The Warming Russian Arctic: Where the Russian Asian Business and Strategies Converge? ”, The Red (Team) Analysis Society, 21 November 2016). With these partners, the Russians are transforming Northern Siberia and the Arctic Ocean into an immense attractor for international trade as well as for energy companies, despite and thanks to the massive risks emerging from the current planetary geophysical destabilization (Jean-Michel Valantin, “The Russian Arctic Oil: a New Economic and Strategic Paradigm?”, The Red Team Analysis Society, October 12, 2016). Given the sheer scale and complexity of this massive endeavour, it is necessary to use strategic thinking to understand what it means for governments, as well as for businesses, to be able to anticipate how the uncertainties, risks and opportunities related to the development of the Russian Arctic, are getting combined on the short and the middle term by the Russian political and business authorities, in order to achieve success. This understanding is necessary for, among others, energy, trade, shipping and trade industries and companies that are attracted by the new Russian Arctic potential, which emerges from the industrial and commercial transformation of what used to be an extreme and deeply hostile environment but is today profoundly altered by climate change, if these actors are to successfully operate. This first part focuses on identifying and using the paradoxical logic necessary to assess strategic situations, thus building upon the interactions between the main levels of strategic thinking. First of all, to understand the Russian Arctic development from a strategic point of view, we have to realise that this development is literally immersed in the paradoxical logic of strategy. Indeed, developing a project, be it political, commercial, military, or of any other nature, creates the emergence of situations that are driven by a paradoxical logic: the implementation of a given project attracts opposing forces, which can even use violence, or difficulties, which threaten the very project that created them with failure (Luttwak, ibid). Understanding this attraction of the opposites and the necessity to use them in order to attain success is the very essence of the strategic approach. In the case of the development of the Russian Arctic, this paradoxical logic is revealed by the fact that an immense industrial and commercial project is implemented because of, and despite, its particularly adverse environmental and economic context. Arctic (Charles Emmerson, A Future History of the Arctic, 2010). 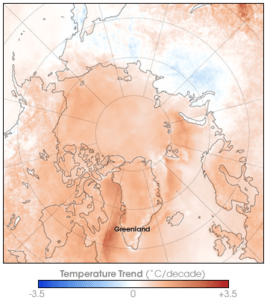 The warming of that region, one of the coldest on Earth, involves the melting and breaking of the ice pack. The excess of accumulated heat in the atmosphere warms the ocean and the land during the summer months. 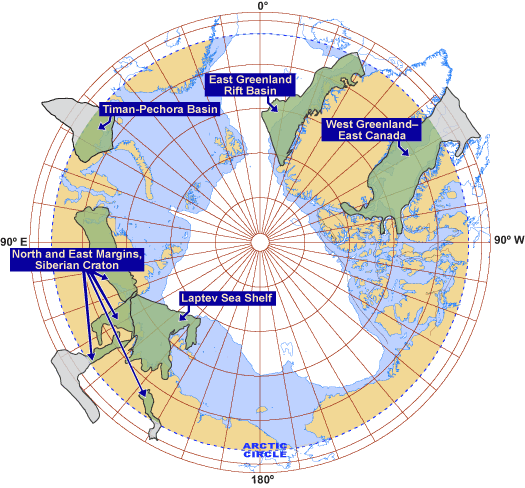 Thus, it drives a disruption of the winter ice pack and weather patterns, hence the emergence of geophysical conditions in this region, so far unknown by humans (Joe Romm, “Arctic Death Spiral Update: What Happens in the Arctic Affects Every Where Else”, Think Progress, May 3, 2016). However, what must be very clearly understood is that this warming does not turn the Arctic into a “less” extreme region. On the contrary, it adds a new diversity and complexity to the environment and accelerates the evolution of its geophysical conditions. Nonetheless, the current warming makes now possible to reach and exploit the enormous oil and gas reserves of the region, because of the relative retreat of the ice. 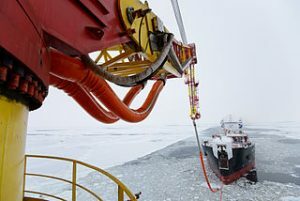 Thus, the fact that the whole Arctic region could have reserves of almost 90 billion barrels of crude and a staggering 1669 trillion cubic feet of natural gas (Energy Information Agency « Russia », July 28, 2015), comes to mean that the development of the warming Arctic could add new and major reserves to the existing Russian diminishing ones. 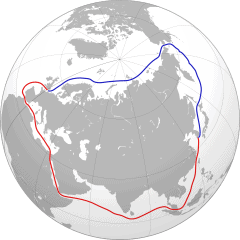 Because of the relative, but accelerating, retreat of the ice, it also opens up a new passage between the Bering Strait and Norway, along the Siberian coast: the “Northern Sea Route”. In strategic terms, this creates a paradoxical situation, because the Russian Arctic industrial project is in fact defined by the interactions of the very Russian Arctic industrial project with extreme and changing environmental conditions, which are both at the origin of the project, while putting it under extreme pressure (Valantin, The Warming Arctic: a hyper strategic crisis, January 20, 2014). In terms of adversity, from the point of view of Russia, the geophysical change of the Arctic is combined with the fact that, since 2014, the U.S. and the European Union have imposed economic sanctions upon Russia, because of the incorporation of Crimea in the Russian federation and of the tensions in Ukraine (see our series, Hélène Lavoix, Crisis and War in Ukraine, The Red (Team) Analysis Society). The sanctions also forbid technically advanced Western oil companies to develop industrial partnerships with Russian companies (Colin Chilcoat, “Is Russia the King of the Arctic by Default?”, OilPrice.com, Oct 22, 2015 and Andy Tully, “Western Sanctions Halt Exxon’s Drilling in Russia’ Arctic”, Russia Insider, 19 September, 2014) . These sanctions combine with the simultaneous dramatic plummeting of oil prices, which results in diminishing the vital Russian oil and gas revenues (Jean-Michel Valantin, “Oil Flood (2)- Oil and Politics in a (Real) Multipolar World”, The Red (Team) Analysis Society, January 12, 2015). 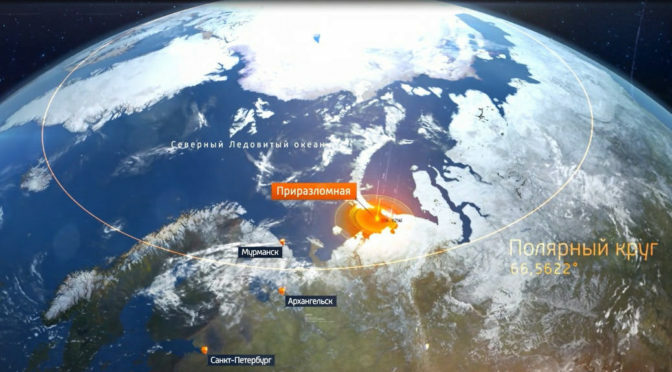 This blend of economic adversities is impacting the Russian economic growth, when the Russian political and economic authorities decide, against these environmental and economic odds, to develop the Russian Arctic. of the Arctic Ocean (Irina Slav, “Why Arctic Oil is Crucial for Russia’s Future”, OilPrice.com, September 2, 2016). By doing so, the Russian authorities may find another way to reinforce the security, power and economic attractiveness of their country. Thus appears the fully strategic nature of the Arctic project, i.e. a project decided and supported by a (geo)political will that is exerted “against a living and reactive force” (Clausewitz, On War, 1832). 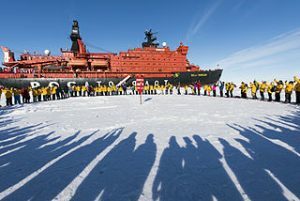 In our case, it means that the Russian political will is exerted to bolster its Arctic project despite, and against, the adverse political and economic forces of the sanction regime and of the “natural” difficulties inherent to a changing and extreme Arctic… as well as because of them. In terms of strategic foresight and warning, including monitoring, this means that we have here identified crucial indicators, and how they are dynamically related, which will allow for a better anticipation and thus navigation of uncertainty. industrial projects to the railroads networks of Russia and of Central Asia, and thus to Europe and China (“Russian Railways to Complete Latitudinal Railway project to the Arctic”, Think Rail Ways, November 19, 2015, Atle Staalesen, “Grand Railway Deal for Yamal”, The Independent Barents Observer, October 20, 2016). In the same dynamic the Russian military Navy has been put in charge of the surveillance and monitoring of the whole region and its projects, and installs bases all around the Siberian coast as well as on the islands of the Russian Arctic Ocean. As the paradoxical logic of strategy let us expect, the environmental and economic constraints outlined previously have driven the Russian authorities to facilitate the emergence of industrial and human resources’ innovations, through the recruitment of young Russian engineers in the energy sector. Those are tasked to compensate the brutal loss of western technological know-how since 2014 and the start of the sanctions regime. 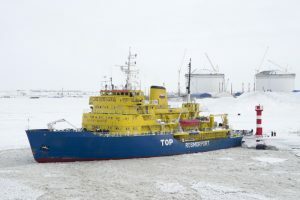 Those engineers are encouraged to be innovative and thus to reduce quickly the gap between the technological needs of the Russian companies and their capabilities in the Arctic (Irina Slav, ibid). Thus, the new potential for the energy exploitation of Northern and maritime Siberia, which emerges, is so attractive that, despite the sanctions regime, some western companies, such as Total and BP, have continued or reactivated their partnerships with their Russian counterparts (Jean-Michel Valantin, The Warming Russian Arctic: Where Russian and Asian Business Converge?”, The Red (Team) Analysis Society, 21 November, 2016). Once again, the Russian political and business authorities have been able to harness the “power of attraction” of Northern Siberia, literally reinforced by the very pressure that are exerted upon them. In other terms, analysing these dynamics in strategic terms leads us to realise that Russia is projecting a staggering amount of political, economic, industrial, military and business power in Northern Siberia and upon the Arctic Ocean. This projection of power reaches such a scale, because it is aimed at creating what we call the “Russian arctic power of attraction”, which is felt throughout Central, South and Eastern Asia. shipping and industry companies to export industrial machines in Kazakhstan (Jack Farchy, “Chinese Lend $12 Bn for Gas Plant in Russian Arctic”, Financial Times, April 29, 2016, (Atle Staalesen, “Grand Railway Deal for Yamal”, The Independent Barents Observer, October 20, 2016, (“First Chemical reactors shipped to Kazakhstan from South Korea”, The Astana Times, 26 July 2016). revolution and of the installation of Stalinism (Moshe Lewin, The Soviet Century, 2005). 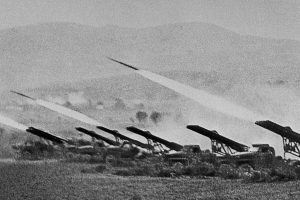 Then, during the savage German onslaught of 1941, Russia moved its western industrial capability to the Ural and Siberia, where it was reassembled, before overwhelming the Wehrmacht and the Nazi military industry with its sheer production capability and strategic sense (Adam Tooze, The Wages of Destruction, 2006). Then, came the long years of reconstruction. Finally, during the 1990s, the end of the Soviet Union saw the terribly destructive economic crisis that ravaged entire sectors (Stephen Kotkin, Armageddon Averted – The Soviet Collapse 1970-2000, 2008) of the Russian industry, before the beginning of the 2000s witnessed the starting of the Russian industrial rebuilding. The current Russian Arctic endeavour seems to be a new phase in the industrial development of Russia, led by a strategy that is aimed at renewing the status of Russia as an international economic power at the time of climate change, which combines itself with the energetic needs of Asia and the tensions with Europe and the U.S. (Anna Andriovana, Elena Mazneva, “Japan makes Arctic gas Move with $400 million Yamal LNG Loan”, Bloomberg, September 2, 2016). This capability to implement a project despite the fact that it attracts and trigger opposite political and environmental forces is the very essence of the paradoxical logic of strategy. Continuing building upon and using strategic thinking, we shall turn to the inner workings of the Russian Arctic development with the next article. We shall notably see how the latter’s different aspects, mainly the industrial operations and the changing environment, are interacting, creating a certain level of “friction”, an essential dimension of strategy. This level of friction is a crucial element for the successful dynamics of this mammoth project. Then, we shall study how the Russian authorities identify and use the current phase of climate change as an industrial window of opportunity and how they behave accordingly, in order to make this project profitable for domestic and international investors.